Mmmmm… I am definitely going to make these, and they are only 4 points for 1 🙂 Does anybody know where I can find light buttermilk? Apparently in all the local grocery stores I've been to they only sell regular buttermik. Is there a substitute I can use instead of light buttermilk? i just made these this evening and they are delish! one question though, how did you get the frosting to set up? mine turned out very runny and not nearly as photogenic as yours! How difficult would it be to turn these into red velvet bars/brownies… that heart shaped cookie cutters could be used… for valentines day? This sounds great, I was just wandering what the fat content per serving is. I just made these for book club and they were a big hit!!! Simply delicious! Thank you!!! So are these supposed to be regular sized cupcakes or minis?? What size cupcakes are these? How can this be adapted to make Red Velvet Pancakes? I've been craving a skinny version for weeks and no dice. 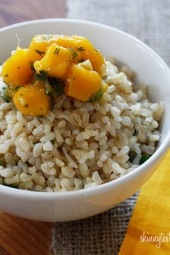 Hi Gina, My niece introducted me to your recipes in July and I have been hooked ever since. I make one of your recipes at least 3 times a week. The Skinny Red Velvet Cupcakes calls for cream cheese, buttermilk and butter. Since I am allergic to ALL DAIRY is there a good substitute I can use and still come out with this fantastic cupcake? Marcy in VA. Saw a recipe for Red Velvet Whoopie Pies on Pinterest…wonder if this recipe would work for that? I'm making these for Christmas this year, with out a doubt. However, I think I am going to turn these cupcakes into cake pops, their so much fun! I was just wondering though, would this recipe still work if i used 2 1/2 cups of cake/pastry flour instead of what you have written in the ingredients? Thanks so much, keep up the great work. hi gina, just a question about substituting the red food colouring. my friend is quite particular about consuming natural products only and i am making these for her birthday. i was wondering if 1tbsp of beetroot juice would work just as well or if there is a better substitute? thankyou and i just lovelovelove your site! Mad props! This is great!! I'm not even a big fan of Red Velvet and I thought it tasted great. I made it for a birthday for my sister-in-law who is a big Red Velvet fan and her and my husband's entire family loved it! My father-in-law who turns his nose up on anything we try to turn "skinny" or "light" or if it has whole wheat loved it. We never told him the ingredients….. I did use regular whole wheat flour as I couldn't find the white. LOVE red velvet and I love that these are skinny!! Now they are definitely the best cupcakes ever. I am going to have to sneak these into Thanksgiving! 🙂 thanks! I'm not usually a fan of red velvet because of all the red dye. But I have a friend who loves it so I made them for her as a surprise. Everybody LOVED them! They were super moist and the cake was almost creamy. No one believed me that they were Skinny. How long would it take to bake if I made these in a cake version instead of cupcakes? hey, mine tasted like playdough , i used unsweetend cocoa powder instead of the dutch processed?? thanks! are these the 12 big cupcakes or for minis please help i am making these in a few days ! Made these for my best friend's baby shower (she's going through major cream cheese cravings) and everyone absolutely loved them and had no clue they had no oil in them! It was so nice to have a points friendly dessert there so I wasn't tempted by others. Thanks for the great recipe! Did you make them as cupcakes? Did you add egg whites? So I made the diet soda version of these and they are DELICIOUS!! The only problem is that they fall apart really easily. Any suggestions to fix that for next time? You could but it would be a bit denser. Hey, just wondering if I could sub the flour in this recipe with 2 1/2 cups of all-purpose flour? Just made the cupcakes an hour ago! LOVE it! 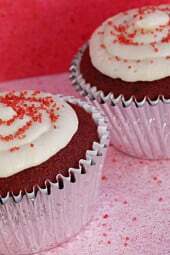 I've been looking for a skinny red velvet cupcakes recipe! Im so glad i found your site earlier today….I can't wait to bring them for easter gathering tomorrow! Cake flour is sifted and lighter, better for baking cakes. It's in the baking section where you find flour. What is cake flour? Is it the same as all purpose flour? Thanks Love! Sure, just bake them longer. Do the toothpick test. Hi Gina…these look amazing! My 7 year old has requested red velvet cake with cream cheese frosting for her birthday tomorrow. I've already made her cupcakes for school, so this would be a cake for the family. Do you think I could use this recipe in a bundt pan? Or another shape? Hi there, I have some yummy pineapple cupcakes posting soon! I was the one with the oily and fattening red velvets. I made chocolate cupcakes and they turned out great! The frosting looks and tastes sooo good. I made these the other day for two friends that were celebrating their birthdays and this was their request. I recently joined WW and said that I will make them but they are going to be skinny. They were a hit across the board!!! Great job Gina!! Thank you so much for keeping my love for cooking and baking alive even though I must to it a little bit healhier!! Yes, I use a mixer. Glad you liked them. Lots of mixed reviews on this one. We made Martha Stewart red velvets and they are sooooo fattening! Yours are so much better! I am making your cream cheese frosting tommorow. Do you beat them with an electric mixer or hand beat them! I make so many of your recipes…and this one I will never make again…the cupcakes are pink (I used liquid food coloring and not paste). I did everything you said to do and in the correct order and didn't change a thing and they are horribly dry. I guess I shouldn't be baking and cooking instead. If you are doing the new WW points plus, then it's 4. That includes the icing. Im sorry but Im at little confused with the points is it 3 or 4 poins total for this. Also is the cup with the icening on top a total of 141 cals for both. I made these for my hubby yesterday. They turned out so good!! I'm not a baker and this is the first cake type thing I've made without a box mix. I was so happy when they turned out delicious! Thanks for the recipe Gina! Yes, add them together, sorry about that! Hi Gina! I will be making these this weekend for my sisters birthday! I was just wondering about the baking soda and baking powder! I didn't see in the instructions when to add the baking powder, but you did mention adding baking soda twice, so I am assuming you mean baking powder somewhere! Can you clarify? thank you much! Are these regular sized cupcakes or mini? I have a 12-cupcake tray and I am hoping to make these over the weekend!! Anonymous, sounds like you want a sweeter batter, adding more sugar is probably what you are looking for. I tried to make this for my Fiances and my annivsary. I did a test run to make sure it would taste okay and everything. I tasted it (with out the icing because the icing turned out too wet) It had no flavor what so ever. Before baking I added a little more cocoa powder because it did not seem to be enough and it still came out bland. I love the texture. Is there anyway to get more flavor? Rosa, I'm not sure why they were dry, did you change anything? Gina – Thanks for the recipe! These tasted really good but mine came out really dry 🙁 Do you think maybe I could've over mixed the batter? I was just about to ask for Points+ but I see the previous person left it. I'm very excited to make these for my first graders and use the green sprinkles to make it Christmasy. Thanks for all these recipes! They're fabulous! I'm going to try making these as a dessert on Christmas this year. I'll use little green sprinkles instead of the red ones on the frosting! VERY excited to try them out! Hi Gina! I made these tonight for a Cooking Light Supper Club I host…and they did not turn out…can't fingure out why. I didnt have any unsweetend dutch process cocoa so I looked on the internet to see what I could substitute and it said I could use unsweetend cocoa powder but omit any baking soda if called for so I did that but I am not sure if that is my problem. They didnt bake up/rise really and were very dense and hard even after 15 min in the oven 🙁 Idea's/suggestions?!?! hi gina i just started weight watchers again for like the 5th time. but i am really enjoying it thanks to all your recipes! i made these cupcakes tonight and i LOVED them. i used reg whole weat instead of white and i used nuefestel cheese instead of cream cheese all of which was an accident lol but i wanted to say THANKS A LOT! The color and possibly the texture, it should be ok to substitute. Is there a difference between white whole wheat flour, and regular whole wheat flour? Is it ok to substitute? I've been in WW's for 3 months now. Your blog has saved me from boredom in the kitchen! These turned out fabulous the first time I made them! I have cooked a handful of your recipes successfully and have been enjoying learning about the joys of cooking! OMG!!! These were AMAZING!!! I recently made these and my 5 year old and I loved them. They were delicious, and I was glad to be able to eat two (being on WW)as well as give my son something healthier than the normal fatty cupcake!! Thank you! Yes, Two ways- I figure out the total points for each ingredient, then divide by servings. Or, I figure out the calories, fat, fiber for the total recipe, then divide by serving and plug numbers into ww calculator. Hi Gina,love,love,love!!! your recipes,how do you figure the points for your recipes,do you add each ingredient together then divide the servings. I cant seem to find the diet soda cake recipe – please help!! I need cake or cupcakes asap!!! Hershey's unsweetened cocoa would work! I'm so excited to try these! I'm restarting WW and my birthday is on Sunday. I've been looking for something sweet as an alternative to cake. I'm so making these!! thank you! @Kate- Thanks for sharing your way around the lack of low fat products in the UK. I wasn't aware of that. Baby food makes a great substitute in baking! I'm happy you enjoy my emails! @Heather- Thanks for the award! i can't wait to try these! ive been looking for a lower fat version! you have an award too! I made these wonderful cupcakes for 9 teenagers this past weekend and they were a huge hit! WONDERFUL! Gina~ I posted my recipe on Saturday… yes to the eggs! These were great and also quite an easy version- some call for more mixing and alternating of the various ingredients. As an English fan of your blogs sometimes I can't do the sweet ones because we don't have so many fat free dairy products. As I usally make my own buttermilk with 0% milk and a tablesppin of vinger this was easy to do. Also, I couldn't find just plain apple sauce but did find a fancy apple and bannana puree baby food which yielded great results. I added a little extra cocoa to compensate for the sweetness of the bannana and it worked really nicely. Thanks Gina- your email outs are the highlight of my colleague and mine's day. A really great resource! @Jewbulous – Glad you like them! Thanks for commenting! The texture should be that of a regular cupcake, not sure how dense you mean? Nothing beats the full fat version for taste but these are pretty close. Perhaps adding more sugar would make them sweeter, but also more points. I love Red Velvet cupcakes, they are totally my weakness too! Thank you for sharing this skinnier version. Hi Sandy, did you use a box cake? I have to try baking with yogurt, I haven't done that. Do you ue eggs? Thanks! I was lazy and used your diet soda cake recipe with red velvet box mix and a can of diet cream soda. It was easy, much lower in points and really good. These LOOK awesome. 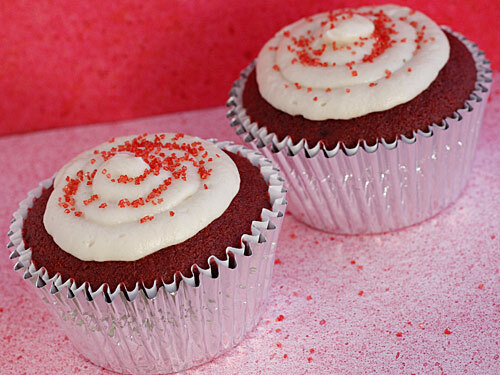 I wanted to make red velvet cupcakes this weekend…..and a skinny version is even better. What is your altitude? I always have problems with cake recipes not working at 7600 feet. Any suggestions? MFebber- I never use Splenda but you can probably use the splenda/sugar blend. Doli- We give them all away to friends and neighbors! 🙂 I might have one or two, I won't lie! I can't resist her red velvet cupcakes! Adriana- have they changed them? Curious about using Splenda in place of sugar? Just wondering where I can find a place to plug in my recipes in so I can find my points. Do you happen to know a website for that? Oh my! I love red velvet cake and am getting that for my bday on Sunday! Your daughter's blog looks amazing! I would become too fat if I was at your home eating all those goodies! If these taste as good as they look, you have a winner! Yes, points and calories include the frosting. Regular cream cheese would make this a little less than 3.5 pts each. If you don't like baking and prefer cake mix, you can always use my diet soda cake recipe! Does the calorie count include the frosting?? Thanks! Big Fan of your blog!!! Can I just use red velvet cake mix? 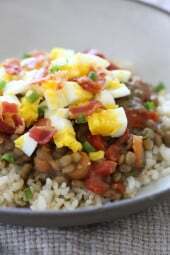 If I do, how to make wet ingredient? Wow thank you for posting this! I wanted to make a yummy treat with my kids for V-day without tons and tons of calories. 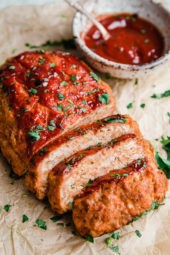 These look so good and I am going to make them this weekend. Sure looks like a lot of ingredients but I am sure it is worth it! What gorgeous cupcakes, perfect for Valentine's Day! This recipe is definitely a keeper. Oh red velvet is my favorite thanks for the recipe and I can't wait to try it out! !